I am fortunate that my house is on a ridge which affords wonderful views from the south to the northwest. The sunsets are often amazing. Still, when I think of broad dramatic skies, my mind turns to the great plains of America. The sky just seems bigger there. A late afternoon drive in the northern great plains a number of years ago was particularly striking. I had to pull off the road and enjoy the brilliance of the scene as it unfolded. It inspired this painting. I haven't painted much from my trip to Antarctica. Not sure why because the continent was certainly inspiring. So, it was time to go back through my notes, my photos, and my thoughts about the trip. Like most people who have had a chance to walk among penguins (and have had them walk over your boots! ), penguin encounters are quite memorable. 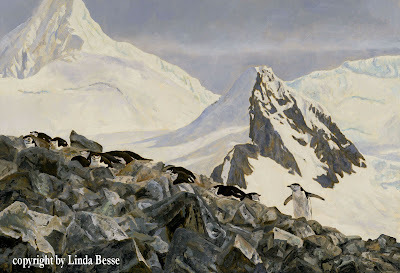 I had a chance to see the nesting areas of four species, Magellanic, Adele, Gentoo, and Chinstrap. All were fascinating, but as I pondered what to paint, a rookery really stood out for me. On one island, Chinstrap climb the side of a mountain and nest among boulders. Watching them negotiate the climb with such agility was incredible. They appear so awkward on land yet looked like graceful ballerinas compared to my climb to the area! Big rubber boots and a 14 pound camera made my ascent more akin to the elegance of an elephant seal. 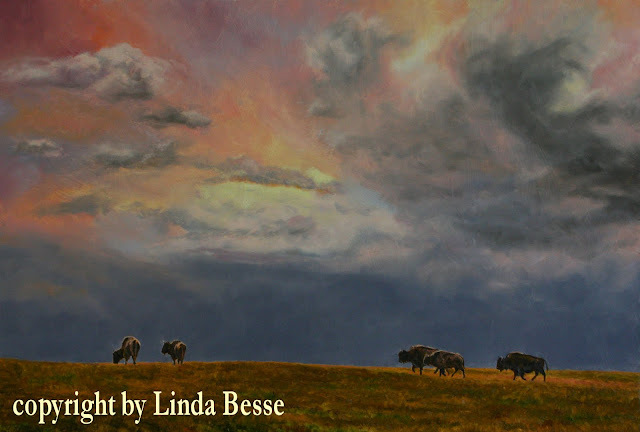 I wanted to showcase them in the painting and create a sense of vastness and remoteness with a sliver of intimacy. Quite a lot to put in a smallish painting. 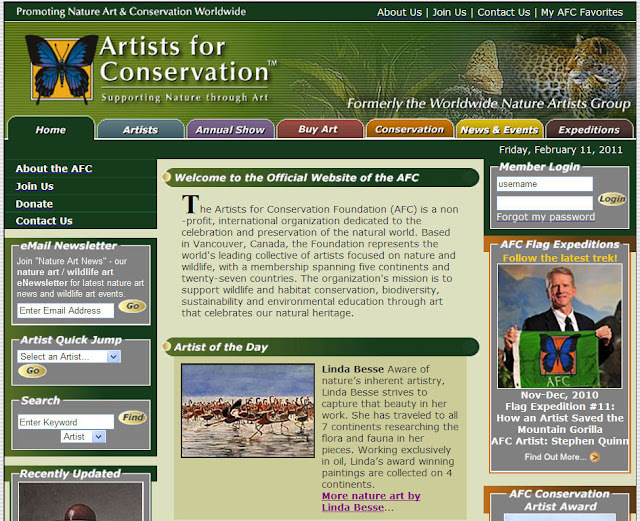 Today I am Artist of the Day on the Artists for Conservation website. If you have not checked out this web site in a while, have a gander.